When you create a Simple Gantt Chart, it provides an easy-to-follow visual path. Read on for instructions on creating a simple Gantt chart! A gantt chart is a visual representation of your project schedule, based on task start and due dates. Project management can definitely be a challenge but with Priority Matrix, you can easily create Gantt charts that match up with your needs. Priority Matrix is a lightweight priority management solution that allows you to organize team tasks and timelines, while building a Gantt chart for you based on the data that you input. You can also modify the date range displayed in your Gantt chart, sort by team member, and display both finished and unfinished tasks. Gantt charts are important tools for project management. 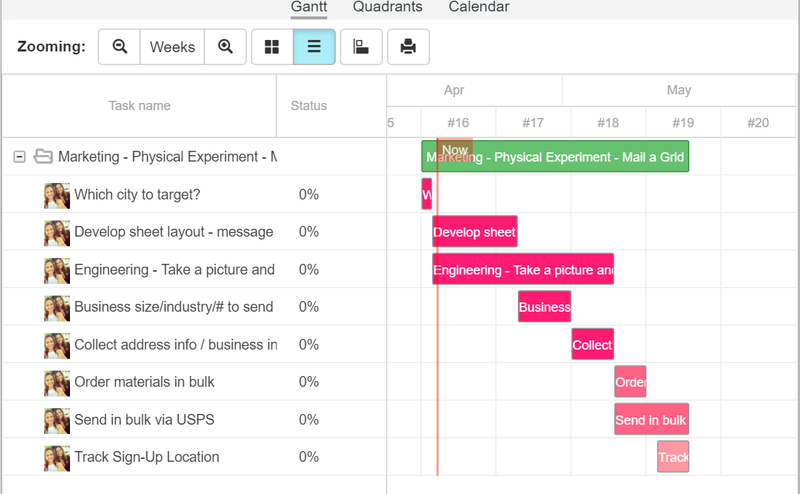 Gantts allow you to easily map out tasks, events, and deadlines in a way that shows project timelines. Using a Gantt bar chart to lay out daily, weekly and overarching agenda items is an effective way to keep each event from getting lost or under-prioritized. Further, bar position Gantt charts let you know what needs doing and the deadline for getting it done. In essence, a simple Gantt chart paints a visual picture of your project timeline, allowing you and your employees to grasp the project more effectively. This is especially useful if there are a lot of players on the scorecard. When using a simple Gantt chart, you should first decide on the completion date sequence for each task. Then, after pinning down other task details such as the expertise required to complete the task, you can delegate the task to an employee. Sometimes, completing a project may even include hiring out-of-house resources such as contract employees or providers. This may sound overwhelming, but by using a Gantt chart that denotes who is in charge of each piece of the project, you can put your mind at ease. How can Priority Matrix simplify the planning and execution of projects? Let’s say your business plans to unveil a new website. The target launch date is 4 weeks from the day the boss throws the project on your desk. The website’s redesign involves a number of new features, distributed across many team members. As you create tasks in Priority Matrix, set due dates, and delegate responsibilities to team members with our 1-click delegation, our product simultaneously creates a Gantt chart for you, that you can access at any time. Priority Matrix is available for your desktop and mobile devices, whether Mac, Windows, Android, iPad and iPhone. Enter your email below to try it FREE today!